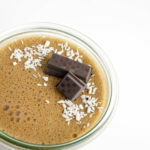 Salted caramel chocolate mousse - paleo - NOURISH TO PERFORM. My instagram stories already speak for themselves… I’m obsessed with with jelly mousse at the moment. I’ve already tried different taste variations and combinations but so far, I’m really hooked on this salted caramel chocolate jelly one. The recipe you can find here is a basic recipe. Depending on your understanding of caramel feel free to add some coconut sugar or date caramel (for date caramel blend dates, vanilla, almond milk and almond butter in a food processor until smooth). Especially adding a tablespoon of date caramel to the recipe gives it an even sweeter and intense caramel taste. An easier solution is to add some date syrup. Another key ingredient is a good maca powder that has a caramelly taste. I personally like Berioo Maca * powder. Apart from that, carob is what gives this mousse this caramel hint. 120 ml almond milk/Mandelmilch macadamia milk is great,too!/Macadamiamilch schmeckt auch super! 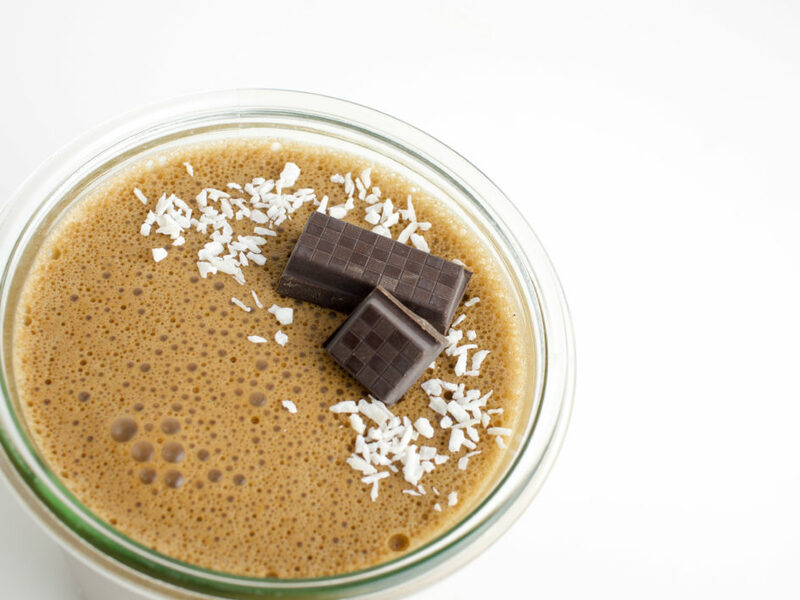 Fill almond milk, boiling water, gelatin, cacao, maca, carob, yacon syrup, vanilla (date caramel/ date syrup/coconut sugar) and salt into a food processor and blend./Mandelmilch, kochendes Wasser, Gelatine, Kakao, Maca, Carob, Yacon Sirup, Vanille (Datelkaramell/Dattelsirup/Kokosblütenzucker) und Salz in einen Hochleistungsmixer geben und mixen. Add crushed ice and mix shortly again. Fill into a jar and put into the fridge for about 20 minutes so that the mousse gets solid./Dann die Eiswürfel dazugeben und noch einmal kurz mixen. In ein Glas füllen und für etwa 20 Minuten in den Kühlschrank stellen, sodass das Mousse fest wird.